Discusses the role of engineers as society enters an Age of Limits — particularly with oil supplies. Engineers did not invent the steam engine — the steam engine invented them. What will a post-oil society invent? This is the fourteenth post in the series “Engineering in an Age of Limits”. We are facing limits in natural resources, particularly oil; our finances (money seems to be increasingly disconnected from actual goods and services); and the environment as we continue to dump waste products into the air, the sea and on to land. We are also facing a transition as the Oil Age comes to an end. This is not the first time that society has faced such a shift. At the beginning of the 18th century the principal source of energy in northern Europe was wood. However the forests were mostly depleted so a new source of energy, coal, had to be developed and exploited. The extraction of coal from underground mines posed new technical challenges particularly with regard to removing the water that flooded those mines. So new technologies, particularly the steam engine, had to be developed. Necessity was indeed the mother of invention. These technological developments led to many changes in society, including the creation of the profession of engineering. The transitions that we are currently experiencing as we look for alternatives to oil are likely to generate equally profound paradigm shifts. How can engineers and other technical professionals help navigate the troubled waters that we are entering? These posts are published at our Welcome page. We also have a LinkedIn forum that you are welcome to join. For a complete list of posts to do with the Age of Limits please visit our . Thank you. This series of posts to do with the upcoming Age of Limits requires that I make predictions about the future. But I find that when I make specific predictions I am often — in fact, usually — wrong. Moreover, when I look at the predictions of writers for whom I have a great deal of respect I find that they are often wrong also when they are discussing specific events and scenarios. So what is the purpose of writing a blog such as this given that none us know what the future holds? I think that there are two answers to this question. 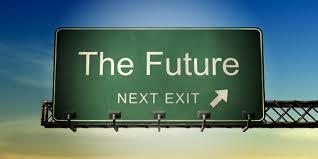 First, we all make predictions about the future in our daily lives, even if those predictions are implicit. For example if someone is deciding whether to buy or rent a house in a particular area he or she needs to think through issues such as long-term trends in house prices and how long he plans to stay in that area. Second, there is a distinction between identifying broad trends and making hard forecasts as to specific events and when they will occur. For example it is clear the sea level are rising and that many coastal cities will be threatened with floods. But no one knows how much the levels will rise by particular dates. If we need a lesson in humility all we need do is look at the following chart. 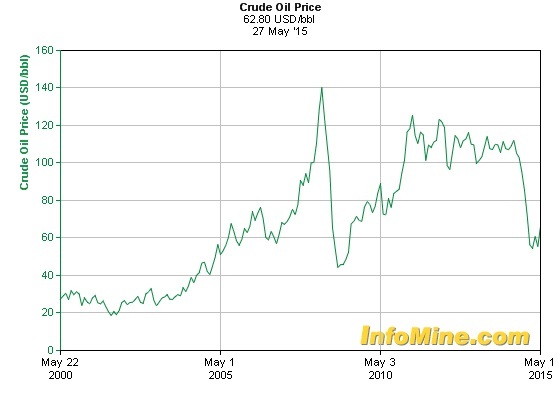 It shows the price of Crude Oil from 2000 to 2015. Up until the end of 2014 the price rose quite steadily at around 9% per annum — considerably more than inflation during the same time period. (There was a big swing in 2008 but that dampened out quite quickly.) But then, in the latter half of 2014, the price of oil plunged by 50% to below $60 and has remained at about that level since. As part of my research into Age of Limits issues I spend quite a lot of time reading the work of expert authors who write about resource depletion and related topics. Not one of these authors, to the best of my knowledge, said at the start of 2014 , “I predict that the price of oil in the second half of 2014 will drop by 50%”. Nor did any of the financial pundits or oil company experts publicly anticipate what happened. If ever we needed a lesson in humility this was it. Yet I cannot recall any of these experts saying at the start of 2105, “I completely missed it last year — I totally failed to foresee the dramatic drop in oil prices therefore any forecast I make as to what might happen in 2016 could be completely wrong”. Yet I have not noticed much humility among the experts. Given that most experts missed the dramatic price plunge it might be expected that they would recognize that they cannot explain the causes of such events. Some of the factors that go into oil price movements include: the availability of finance, political rivalries, the geology of the oil fields and the economic health of the consuming nations. No one can possibly understand all of these or how they interact with one another. Yet, within a matter of months, everyone knew for certain what had caused the changes (although the reasons differed from one expert to another). Once more humility was not to the fore. The book Black Swan by Nicholas Taleb received considerable attention because he talked about wrenching, unexpected changes and how conventional risk management tools fail to forecast such changes. He states that there are three key features of a Black Swan event. After their occurrence, those involved rationalize what happened. Most people look only at the first insight — the fact that these events are a surprise and not predicted. But I find the third point to be of particular interest: people quickly rationalize what happened — the surprise factor is quickly forgotten. It should also be recognized that although most analysts are confident in their explanations they do not necessarily agree with one another. For example, Stanford economist, Dr. Wolak in a March 2015 paper provides seven possible reasons for the fall in price. Yet he does not mention two reasons that are widely touted by many other authors: the desire by OPEC to drive the American shale oil producers out of business and the possibility that the economy simply cannot sustain higher prices without slipping into recession. Nor does he explain why the price fell so quickly. This does not mean that he is wrong. But it does mean that, six months after the event, there is profound disagreement among analysts as to the causes of that event. I recently attended the 2015 EIA (Energy Information Administrati0n) annual meeting held in June 2015 in Washington D.C. The role of this government agency is to provide “Independent Statistics and Analysis” on energy-related topics. There were two tracks, so I could not attend all of the presentations. However I did attend probably about 75% of the talks. The speakers were from different organizations and companies and each had their own topic. But I was struck by the following. Not one of the speakers said words to the effect, “I did not predict the dramatic drop in the price of oil last year so maybe you should use caution when listening to what I say this year”. They all assumed that the current price of oil would stay at about its present level, say $50-60, for the next few years. They also assumed that there would be a continuing glut of oil on the market and the OPEC would have trouble moving its surplus. Other analysts take the same approach. For example, Frank Wolak, , whose work has already been cited, states “Global oil prices may stay low for the next 10 or 20 years”. He also said, “predicting the future is always fraught with uncertainty.” Yet his forecast does not express such uncertainty. The fact is that a new reality concerning oil prices has developed, everyone is confident in their predictions and it is obvious as to what is causing these changes. What we see going on is linear thinking, an assumption that tomorrow will be very much like today and any changes will be gradual and manageable — in other worlds there are no blacks swans about to land. People who are confident in their statements do not need to hedge their statements so much. In last week’s post we discussed the draft encyclical that Pope Francis is about to circulate. In it he talks about the ills that we face — not just climate change, but also excessive use of digital media and our lack of attention to the needs of poor people. He does not mince his words. He speaks with confidence and authority. One of the reasons that forecasts tend to miss the mark is that people making those forecasts tend to mix ‘climate’ with ‘weather’. Regarding the climate we can see long-term trends and talk about them with some confidence. It is reasonable to say that, over the next twenty years, global temperatures will increase and sea levels will rise. However, the weather in my part of the world has been cooler than normal for the last three years — particularly in the winter. Therefore I would be foolish to make strong predictions about next winter’s temperatures or snowfalls for my town. Another problem to do with forecasting in an Age of Limits is that many of the people who work in this area tend to make “doomer” forecasts that do not pan out. Their extreme comments damage the credibility of not only themselves, but the movement that they represent. For example, one analyst who has shrewd insights regarding the economy and its relationship to financial systems is Stoneleigh (Nicole Foss). She published a post 40 ways to lose your future in June of 2009 . In it she makes predictions as to what changes are likely to take place. Although we have not seen demand collapse prices have fallen a lot. Ordinary people are unlikely to be able to afford oil products AT ALL within 5 years. Here we are in the year 2015 and the freeways seem to be as congested as ever. So far as I am concerned, the future has no narrative. The future does not exist until it has become the past. To a very limited extent, prediction has worked. The sun, so far, has set and risen as we have expected it to do. And the world, I suppose, will predictably end, but all of its predicted deadlines, so far, have been wrong. 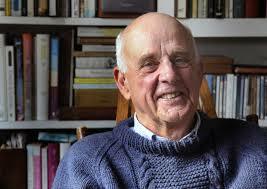 The End of Something—history, the novel, Christianity, the human race, the world—has long been an irresistible subject. Many of the things predicted to end have so far continued, evidently to the embarrassment of none of the predictors . . . How can so many people of certified intelligence have written so many pages on a subject about which nobody knows anything? He advises that we do the right thing, which in his case is to tend the earth properly, and not worry about what the future might bring. Voltaire expresses the same sentiment at the conclusion of his book Candide, ou l’Optimisme (written in the year 1758) when he says, Il faut cultiver son jardin — we must cultivate our garden/fields (although this sentiment does not protect his protagonists from an invasion of Bulgars). Predicting the future is fraught — the truth is no one knows what tomorrow will bring, much less what the world will look like a generation from now. But some tentative conclusions can be made. I cannot tell if it next winter will be colder than normal but I am confident that twenty years from now many coastal cities will be building barricades to keep out the rising sea water and/or simply evacuating. Sooner or later the world supply of oil will start to move inexorably downward but it will probably be at a later date than we anticipate. We are discussing enormously complex systems here; trying to understand the relationships between all the parameters and variables is impossible. Live a modest lifestyle consistent with your forecasts. Voltaire’s satire that we have just alluded to can be seen as a work of optimism in spite of all the bad things that take place. Therefore, where possible, I will end these posts with a few words of optimism. (I started doing this in Denying Blackbeard — Part 2 and Renaissance Man and Climate Change.) In this post I offer the following thought. Even though the future looks bleak focus on what we can achieve in the current circumstances. Our books, published by Elsevier, include the following titles.